A Cellar Rat! 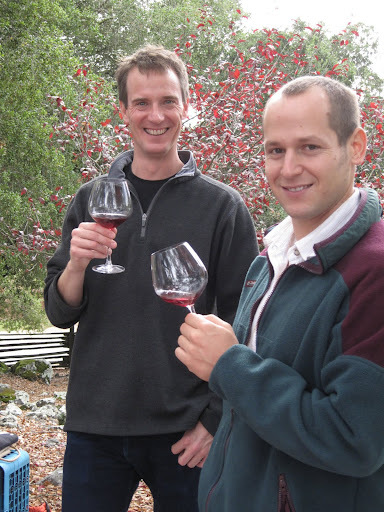 When I first met Alan Baker, aka @thecellarrat, I was in my first year of making a mess wine at Crushpad. What I didn’t know, or rather, the connection I failed to make, is that he was the same Alan Baker who was the voice behind this crazy podcast that I had become addicted to over at Cellarrat.org. Mind you, this was before I was a wine blogger, before I was the “glue that holds the twitter wine universe together”, and before I was Wine Biz Radio’s #1 fan. Ahhh the olden days. The months past, and I would see Alan every now and then around Crushpad, like a mad scientist on a mission to create the world’s best wine for himself, and other clients at the same time. Enter Cellar Rat wines. I first tasted the Cellar Rat syrah at one of Crushapd’s infamous tasting events parties, where Alan was pouring a touch of pinot and a smattering of syrah. WOW! I was blown away by this wine. Both the pinot and the syrah were outstanding, and somehow, I was lucky enough to get a door prize (thanks Alan!) in a bottle of syrah that I took home and squirreled away for safekeeping and later drinking. 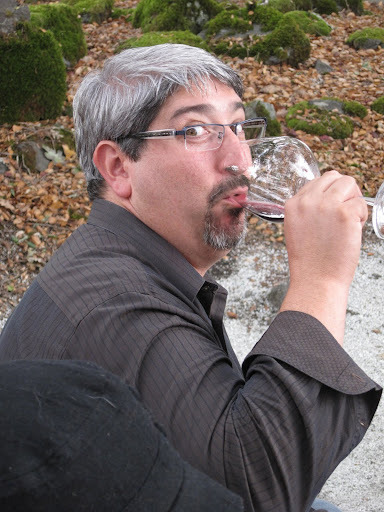 Fast forward 3 years, and Alan is now working with Arista Winery where he can both hone his winemaking craft and work on his social media and broadcasting skills. I somehow convinced, cajoled, and begged him to let us come up and taste his pinot noir in progress, and so a blogger’s binge was born. On a recent cool and foggy day, we met up at the picnic grounds of Arista, off of Westside Road in Healdsburg to talk wine, blogging, and fun. Amongst the hoards were Patrick Llenra (@oenophilus), Marcy Gordon (@marcygordon), Hardy Wallace (@dirtysouthwine ), Ashley Routson (@thebeerwench), Shana Ray (@sharayray), Paige Granback (@thesnarkhunter), Danica Sattui (@danicasattui), and of course Alan & Serena. Cool and foggy but happy, we set out to taste the latest and greatest. Patrick Llerna, the birthday boy! First, we started out with a barrel sample of the 2008 Two Pisces Vineyard. This vineyard is located just west of Petaluma, and has a wide variety of soil types, giving it a lot of diversity. With 5 clones planted, I tasted sour cherries in this rich and spicy pinot, with bright raspberry flavors and classic Russian River Valley character, with cranberries and cinnamon. 33% new French Oak gives the wine just enough structure and spicy without going overboard. Though I rather enjoyed this wine, Alan says he’ll definitely add some bigger fruit pinot in to the final blend, since it already seems to be falling off a bit. Tasty tidbit about this vineyard: This is where our Bus 4 Cellars 2009 Sparkling Wine is coming from! I’m excited about hte potential in this pinot, and what it means for my fledgling bubble enterprise. The 2008 Split Rock (also known as Gap’s Crown, but they don’t like us to say that) is in the Sonoma Coast AVA, near Petaluma. The cool growing region helps develop concentrated flavors that aren’t overripe. Some of my favorite northern California pinots are from here, like Humanitas and Stomping Girl. In the Cellar Rat, I found sweet cherry cola, strawberries (Shana’s favorite! ), white pepper, and nutmeg. This tasted of rich dark red fruit. Yum! Finally, we had the finished product in the 2006 Wentzle Vineyard Pinot from Anderson Valley. This is the pinot I tasted at the Crushpad party, and it was even better than I remembered. This wine was held in a combination of barrels, most notably one new barrel, one zebra barrel, and two neutral barrels, and then blended to created the finished product. Now if you don’t know what a zebra barrel is, it’s a mad coopers experiment in fermentation where you basically deconstruct one used and one new barrel, stick it back together with every other stave being from one or the other. You know what I mean, one new french, one used, one new one used, etc. This is one way to accomplish x% of new oak, without actually using separate barrels and is quite effective for the small winemaker. This finished wine was lighter in style, and true to what I would expect in the Anderson valley, with black raspberries and earthy mushroom characteristics with just a touch of Dr. Pepper. The nice thing bout this wine is that it has the bold flavors that I’ve come to love in a California pinot, but its’ very subtle and not overpowering by some of the Syr-Pinots or Pino-syrahs I’ve had from parts south. The Pinot 2.0 was crushed wtih about 7% whole clusters remaining, and these whole clusters were fermented with native years. The rest of the juice was inoculated with yeast, and when blended with the whole clusters and the combination of the different oak barrels, it makes for a truly stunning pinot. If you can bribe Alan, I HIGHLY suggest you get your hands on some of this, because it’s AMAZING and the $42 price tag is worth every penny. I have great hopes for the future Cellar Rat (or whatever he names it) projects to come, and can’t wait to taste the barrel samples along the way. Thank Alan for having us up and check back for my notes on the Arista Pinot-Thon soon! Samples were provided by Alan Baker of Cellar Rat. No actual rats were harmed in the tasting of this wine. haha–No rats were harmed! Or farmed or charmed for that matter. I've already placed my order for more Pinot. I am a quick study. Thanks for the kind words Thea. BTW because you all were so offended that the Syrah label was going away I picked up a ton of Syrah for an 09 vintage. The grapes came from Grist in Dry Creek, about 200 yards from where the 05 grapes were grown! Pressing to barrel tomorrow. I'm totally pumped with the wild child it has become. And Friends and Family Pinot sale starts tomorrow. DM for deets. @cellarrat. peace out. lemme know when you're back north we'll barrel taste after malo. I will be pinging you for the pinot for sure! Love everything about this! Thanks for srhiang You look fabulous! I’d still love that yummy sangria recipe you shared a while back, on your Cinco de Mayo party post!